The chocolate lover’s favourite. 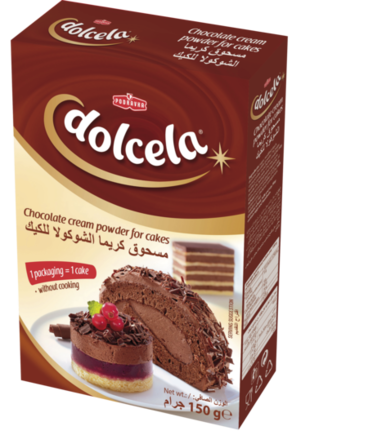 This versatile cream transforms cakes and puddings with its delicious gourmet flavour. Alternatively, simply enjoy on its own. Filled with calcium-rich milk proteins and chocolate powder for a taste that tantalises the tastebuds. To make a light cream: Pour 200 ml of chilled milk into a deep bowl. Add the contents of the packet and stir, then whip the mixture for 4-6 minutes with a blender and add sugar for a sweeter taste. Serve the cream straight away or chill before serving. To make a cake... show more To make a light cream: Pour 200 ml of chilled milk into a deep bowl. Add the contents of the packet and stir, then whip the mixture for 4-6 minutes with a blender and add sugar for a sweeter taste. Serve the cream straight away or chill before serving. To make a cake filling: Prepare following the instructions above but with 125ml of milk instead of 200ml. The mix can be used to fill sponge cakes – simply moisten each layer with a couple of tablespoons of milk or fruit syrup before spreading the filling over it. One packet of cream is enough for one layer of cake. When the cake is finished, refrigerate for 1 to 2 hours. sugar, modified starch, dextrose, powdered chocolate 7% (sugar, cocoa powder, cocoa butter, emulsifier-soy lecithin), 4% cocoa powder, hydrogenated vegetable fat, glucose syrup, emulsifier (E 472), milk protein, thickener (carrageenan), acidity regulator (potassium phosphates) May contain wheat, eggs and hazelnut in trace amounts. Storage: keep in dry and cool place.